The Large Hadron Collider has today surpassed 2000/μb/s in peak luminosity for both ATLAS and CMS. This was achieved during the Adjust phase of fill number 1992 using 1380 bunches per beam, just before stable beams were declared this morning. Luminosity has been gradually increased above the 1280/μb/s limit reached before the technical stop at the end of last month. So far only emittance has been used to enhance the luminosity. This does not increase the overall intensity of the beams so there is no increased risk or extra demand on the cryogenics. At the recent mini-chamonix meeting it was predicted that emittance could provide an extra 35% luminosity but now they are 55% above where they were before. This extra is probably just due to the fact that the final runs before the technical stop suffered from some emittance blowup or injection losses that meant they were not as good as they could have been. It was intended that further luminosity improvements would be attempted by increasing bunch intensity. This has the potential to double the peak luminosity again. This plan has been held back because of the technical difficulties of running at the high intensities they are now using. This can effect the vacuum and cryogenics leading to premature dumping of the beams and increasing times for returning to stable beams. Indeed the current rate of luminosity delivery is around 35/pb per day, just slightly better than the 30/pb per day when they ran with 1092 bunches during June. The proportion of time in stable beams recently has only been about 30% but there are signs that this is getting better. There are just 24 days left before they break for the next Machine Development slot and the beam operation groups will be keen to make further progress with both stability and luminosity during that time. With 1.75/fb now delivered they are already on target to reach 2.6/fb at the next technical stop. After that there will be a final run lasting eight weeks before they switch from proton physics to heavy ions for they last part of the year. 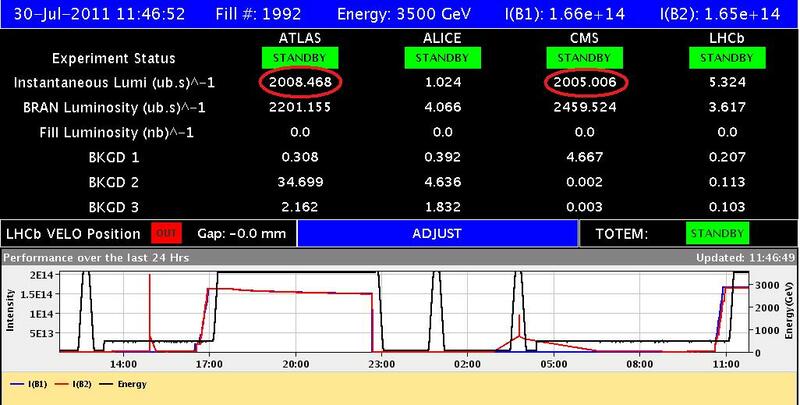 It is not yet clear at what point the experiment collaborations will decide to update their analysis but clearly this level of data is guaranteed to have enormous impact, especially on the Higgs searches. Now that the Tevatron Higgs combination is public and I can see how much error there is in the direct combination process, it seems like a good idea to redo my earlier combinations. I know lots of people are interested to see these now to give information about where we stand. The Tevatron results are still best at the lowest masses so let’s combine the new Tevatron combination with this one. there is most uncertainty in the regions where all experiments have similar limits. 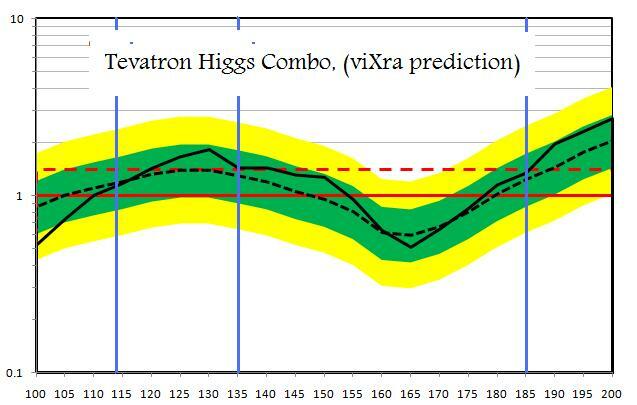 What this is showing is that an excess around the 140 GeV area is possible but it is not likely to be consistent with a standard model Higgs because it is below or near the red line. If the excess is at the higher limit as I expect then it will have at least 3 sigma significance. 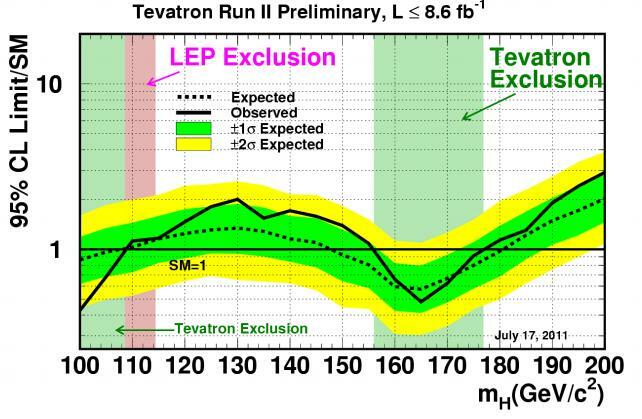 If you compare this with my previous Standard Model Killer plot you will see that the black line is slightly lower at the minimum point because of the marginally less restrictive Tevatron combination. 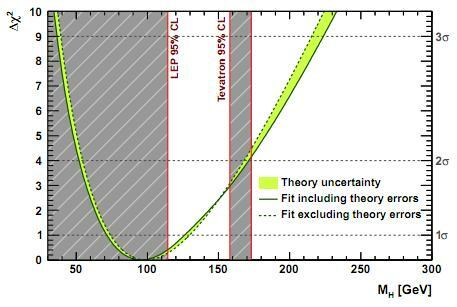 The combination uncertainty now added in grey shows that the Δχ2 could go as low as 2.5. Although this is not as dangerous for the Standard Model as before it still corresponds to a 90% or better exclusion for all Standard Model Higgs masses. Some of the updated SUSY model fits only manage an 85% exclusion and other less restricted supersymmetry models would surely have a better chance. I think it is therefore reasonable to claim on this basis that Supersymmetry is in better shape than the Standard Model Higgs. This is contrary to the slant from the media and some other blogs who suggest that the excesses at 140 GeV are hints of the Higgs Boson while supersymmetry is in more trouble. Of course many possibilities are still open and more data will certainly make a difference. Update 29-July-2011: To be clear about what this does and does not rule out. We indirectly rule out a lone standard model Higgs boson of any mass with no additional BSM physics at 90% confidence, i.e. a fair bit short of conclusively. We do not say anything about other BSM Higgs-type mechanisms including composite Higgs, technicolor Higgs, Higgs doublets, SUSY Higgs, Fermiophobic Higgs etc. These would require a separate analysis. 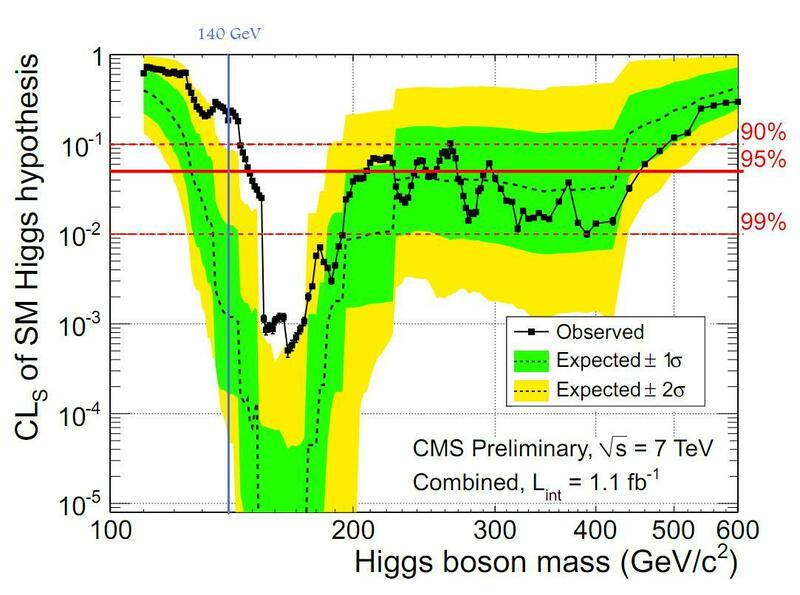 We do not rule out high-mass Higgs bosons above 480 GeV in combination with other BSM physics that could explain electroweak fits and cure theoretical limitations of the SM at higher energies. We see excesses at around 130 GeV to around 160 GeV that could be over three sigma level. It might suggest some new physics such as some kind of Higgs particle(s) in this region. However, these are spread wide and are near the exclusion limit. Perhaps a different Higgs model would fit better than a lone Standard Model Higgs boson. As you can see I got it pretty close. 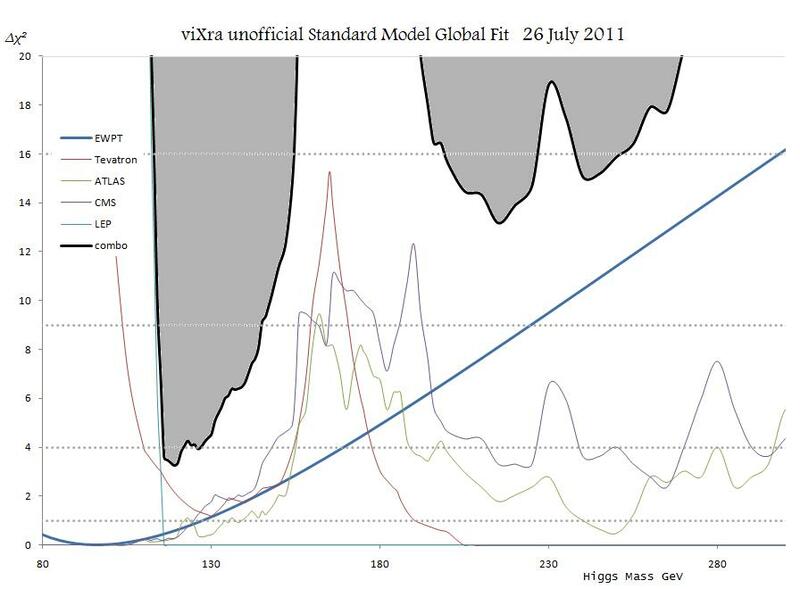 The main difference is that the peak excesses at 130 GeV and 140 GeV are a shade more pronounced on the official plot. The difference is about half a sigma. That is good news because it enhances the chance of new physics (such as a Higgs) in those regions. There is a lot of interesting talk around the blogs about the fate of SUSY and even the whole field of phenomenology. It is a fascinating debate. The CERN DG had some words of caution to give us during yesterday’s press conference. These are early days for the LHC and we should not imagine that it has already given a definitive report, but it has made some good points along with the Tevatron. The Higgs sector does not look like what the standard model predicts. There are hints of something in the light mass window but it does not look like the SM Higgs. It does not have sufficient cross-section and may be spread out over too wide a mass range. It is too early to say what that is, or even if anything is really there. Much more data must be collected so that each experiment can separately say what it sees. That could take until the end of next year, but we will certainly have more clues at the end of this year. If the Standard Model is out, then we cannot be sure that some heavier Higgs is not another possibility. It just wont be the SM Higgs. 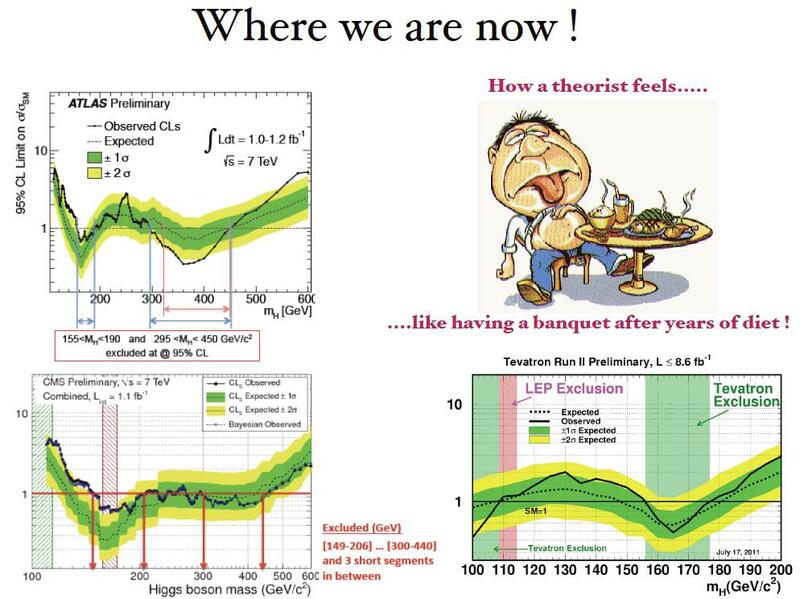 SUSY predicts a light Higgs but all the searches for missing energy events predicted by SUSY have been negative so far. Does this mean SUSY is dead? Of course is doesn’t. Some of the simpler SUSY models such as MSSM are looking very shaky, but there are other variants. 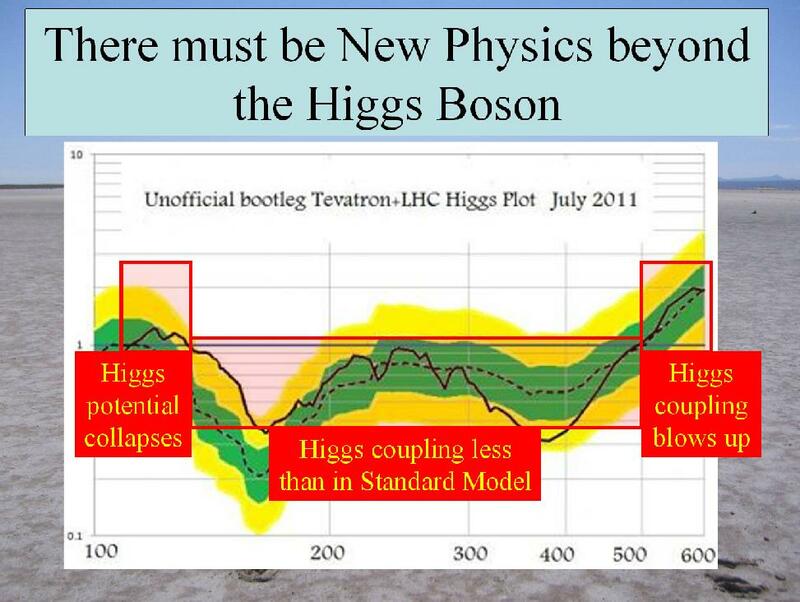 We need some SUSY based fits using all the available data including the Higgs searches. Hopefully the phenomenologists will provide some updates for those soon to let us know what the conclusions are. I have explained in the past that SUSY is a well motivated theory. Many phenomenoligists have put a lot of work into it, but if the LHC rules it out I am sure they will be the first to give us the right reasons to think so. I don’t agree that the work of phenomenologists has been a waste of time. Without their research the experiments would not have been able to set up the model based tests that have told us so much. A lot of different ideas apart from SUSY are being tested. They can’t all be right. Following the EPS conference there will be a number of follow-up meetings to discuss the implications (see the Calendar). This will be the time for the theorists to come back and tell us what is left on the table. It will help the experimenters to prioritize the searches they want to put most effort into as more data becomes available. The parameter space of SUSY is large and flexible but everywhere it describes a Higgs sector that is different from the standard model. 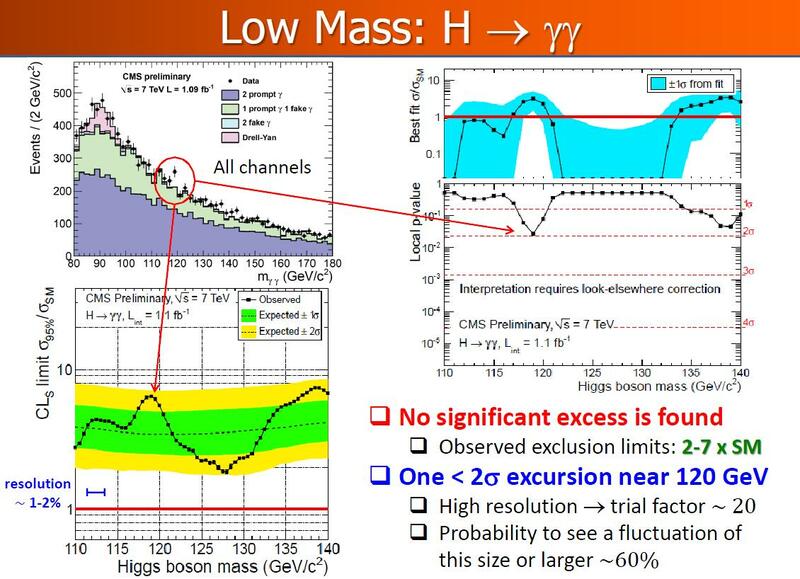 That is why I think the Higgs sector is crucial to understanding whether SUSY at the electroweak scale will live or die. That part of the story is still at an early stage. The next chapters in this gripping tale will unfold in the next few months. There could be several unexpected twists on the way. 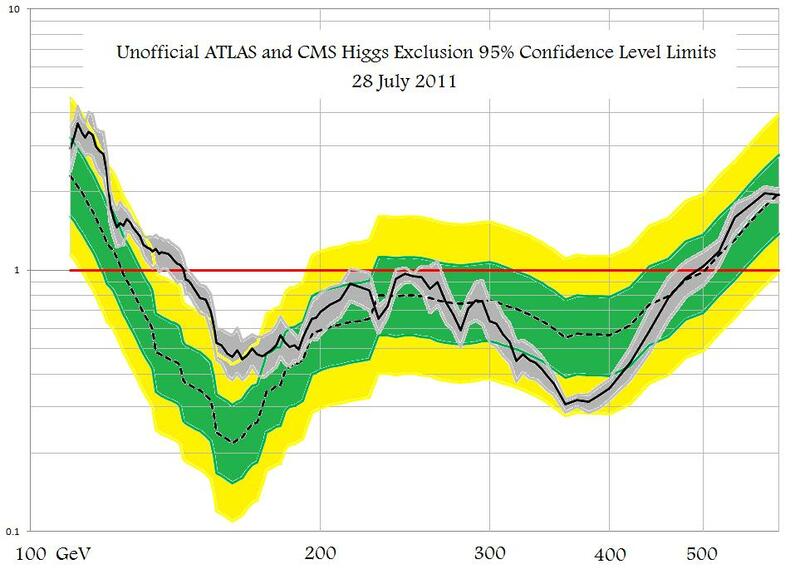 A few days ago I showed how to combine the Higgs confidence level plots by adding in inverse square. At the time I did not understand why this worked (I am a bit slow at statistics.) Since then I have looked again at the work on electroweak precision tests and the global fit where you can find the same calculation being done. The inverse square of the 95% confidence level limits is just one-quarter of the Δχ2 estimator. For independent variables these can be directly added to give an overall Δχ2 which can then be mapped back to an overall confidence level limit. This is exactly what I was doing in my combinations. So now I know that these combo plots are essentially correct, neglecting any correlations which should be zero. 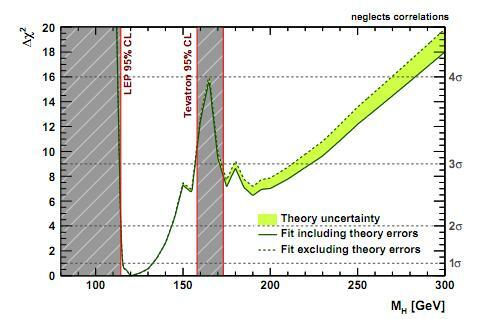 The latest update to the Global Electroweak Fit was submitted to arXiv earlier this month. 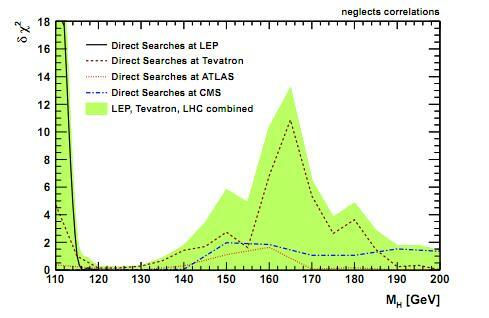 There is a good plot showing the Δχ2 combination of the results from LEP, CMS, ATLAS and the Tevatron. The region below Δχ2= 4 tells us what is allowed at 95% confidence level. 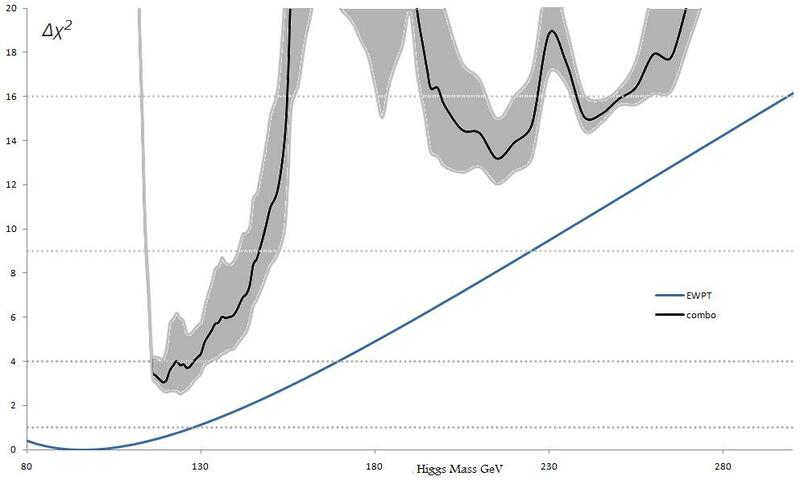 Already this plot limits the Higgs mass to between 114 GeV and 143 GeV assuming that the standard model is correct. 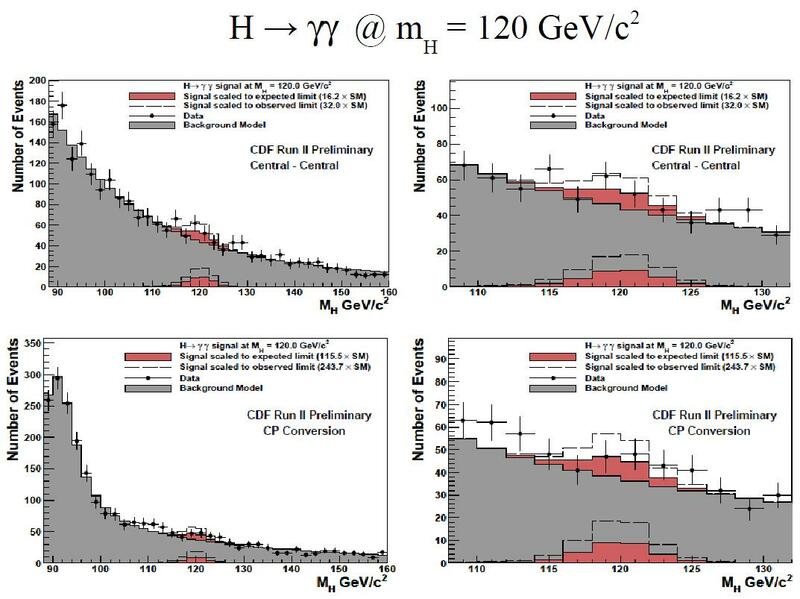 These results were derived before the recent results of direct searches for Higgs announced at EPS HEP Now we just have to wait for the Gfitter group to update their charts using the new data. Of course you know that I am impatient and want to see this now so here is my unofficial reconstruction of the global fit using the recent direct searches and the electroweak fit from gfitter. As you can see there is nothing in the gray region that survives at 1 sigma level. At 95% confidence everything is excluded except a small window between 115 GeV and 122 GeV. In this region the Standard Model vacuum is unstable. In conclusion, the Standard Model is dead (or at least badly wounded 🙂 ). This does not kill the Higgs variants in other models such as MSSM but other fits can and will be made for these, not by me though. The plenary sessions of EPS HEP 2011 start today and we still don’t know who will give the opening address in one hours time. 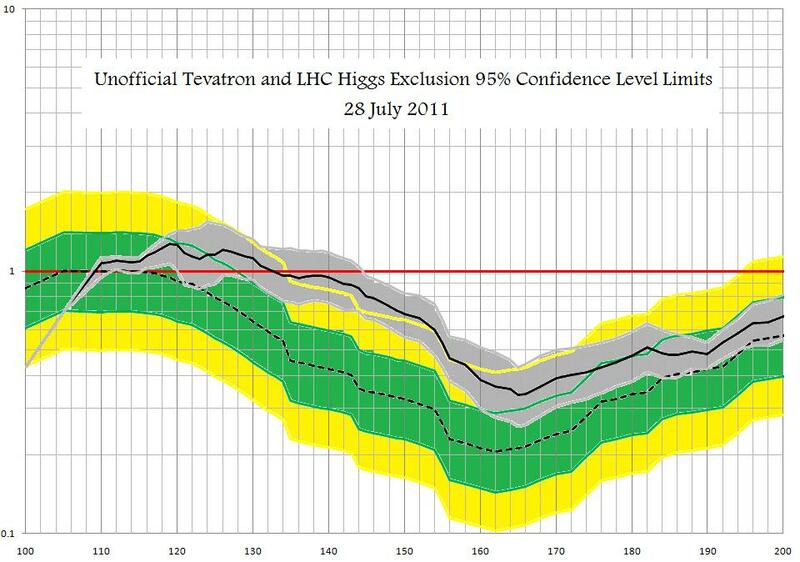 This is a good moment to review what we have seen so far about the Higgs before the Tevatron and LHC get to have their final word on Wednesday. A few days ago I said you should hold your breath for some exciting Higgs results over the next few days, weeks or months. There was some skepticism over at Reddit but I have certainly been proved right for the first part of my prediction. The last few days have seen some spectacular results. We can now look forward to more developments for the rest of this year, but first let’s look back at what we have. 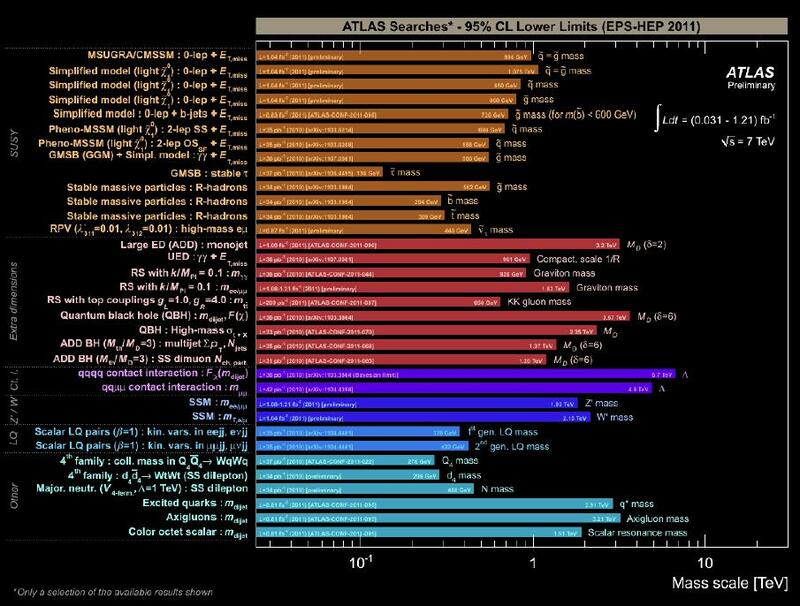 These plots have led to a lot of excitement from the media about hints of the Higgs at around 140 GeV, but some caution is required. The excesses are not yet very big. If we believe the theory that the Higgs Boson must exist and that it is ruled out at high mass then we should be ready to accept the observed signal. At the very least the chances are that something good is going on in the mass region for a light Higgs. 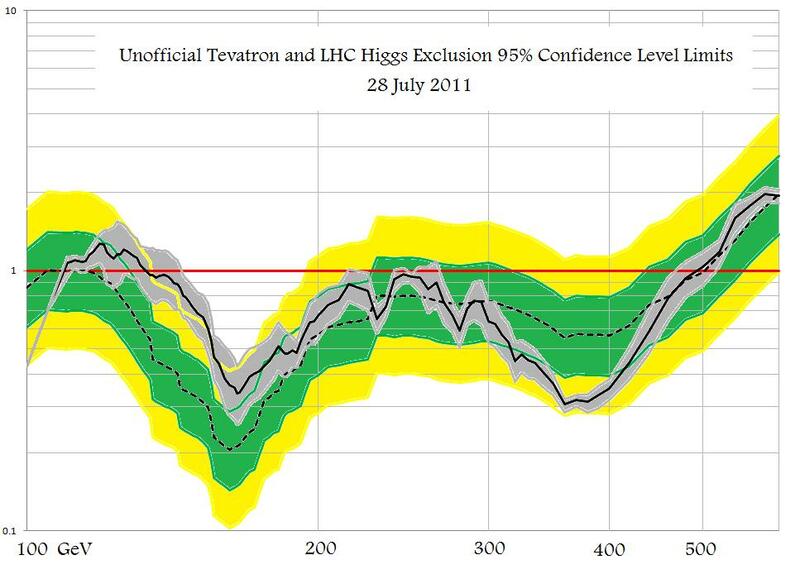 This chart, if correct, excludes the Higgs between 135 GeV and 185 GeV at the 90% confidence level. 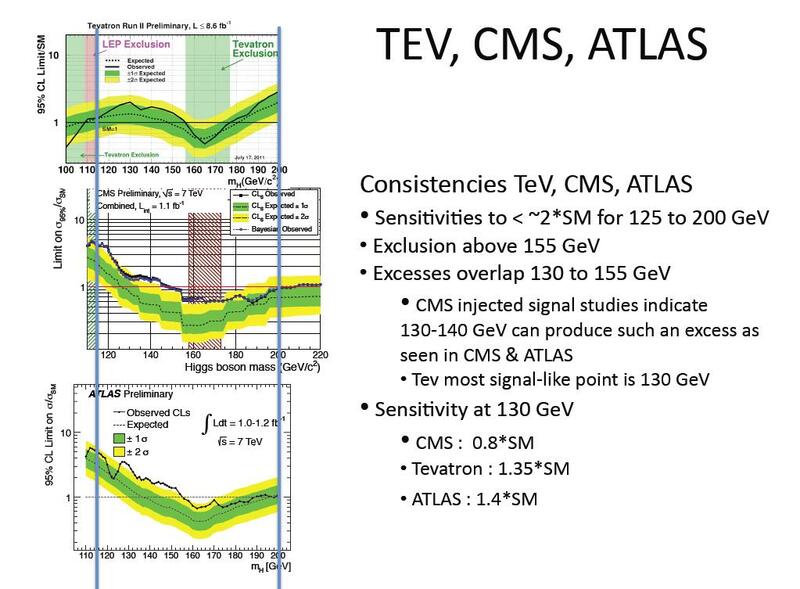 Above 185GeV a standard model Higgs is ruled out by precision measurements. 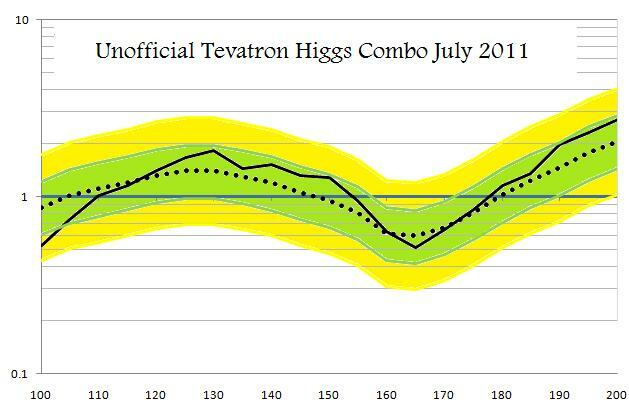 This is consistent with the Fermilab press release that claims they have shown that the Higgs is “most likely” to be between 114 GeV and 135 GeV. 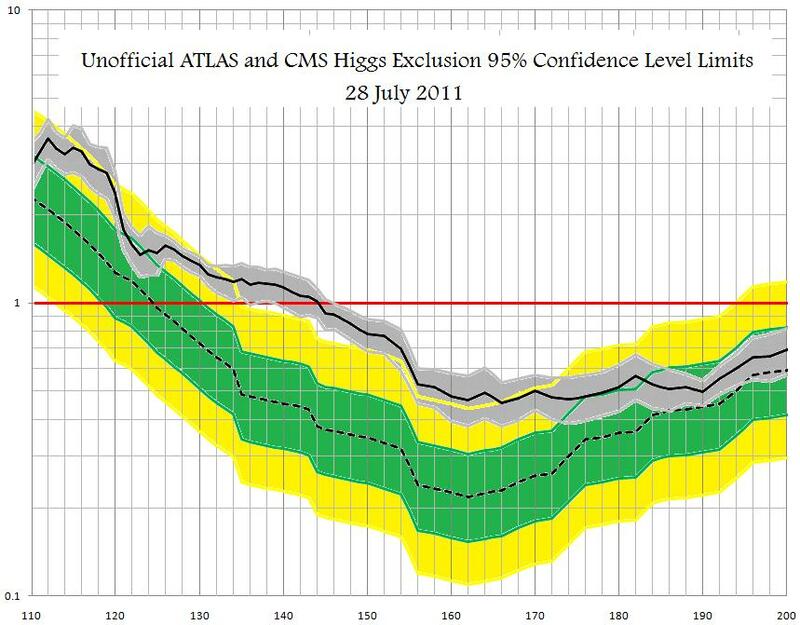 However, 90% confidence is not a very strong level and there is still an excess in the same area seen by the LHC, albiet not as striking. So there is hope that some kind of Higgs particle is lurking in that region, but the signal is not strong. Some modified form of Higgs mechanism with multiplets may be a better fit to the data. 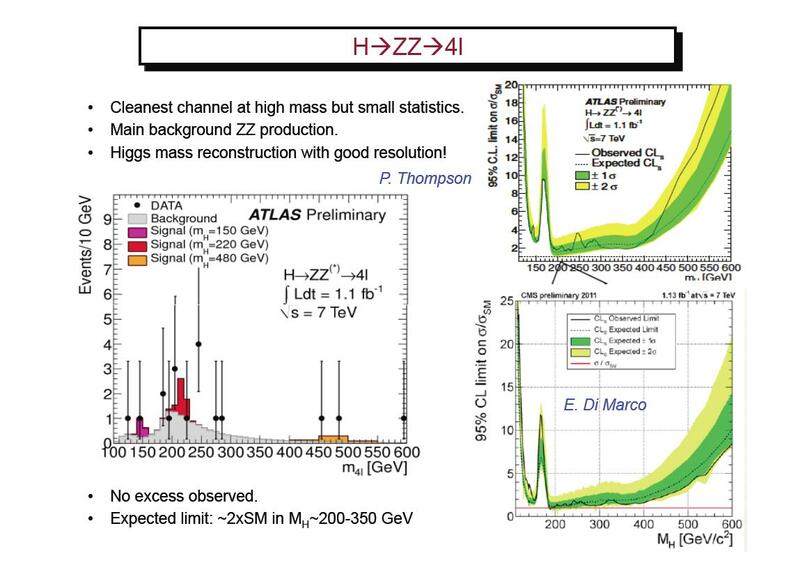 If my predicted full combinations are correct a standard Higgs may already be all but ruled out even at low mass. A SUSY multiplet can still work but searches for MSSM signals have excluded the best parts of the SUSY spectrum. There is certainly a big conundrum here. Theorists may be sent back to the drawing board, but it is too early to say. When will we know more? 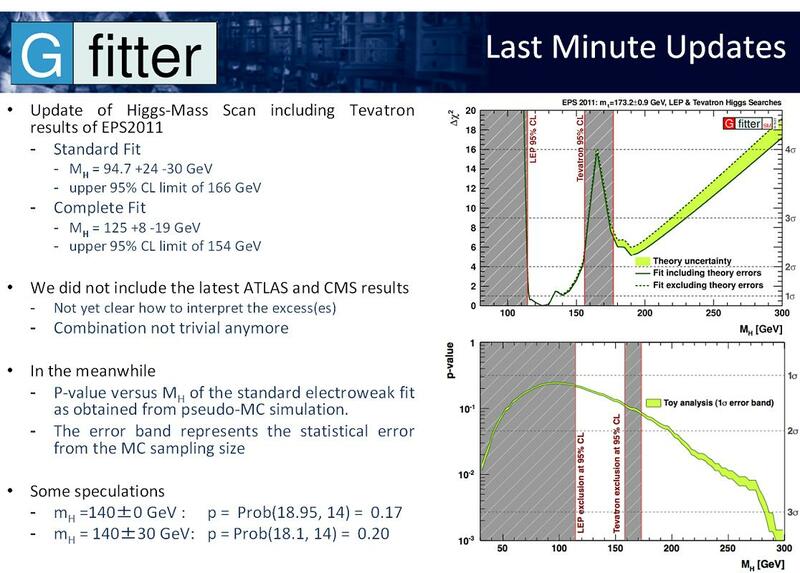 The official full LHC combination is due to be presented at Lepton-Photon 2011 in Mumbai, four weeks from now. They are not likely to show much more at that conference because it would mean starting the analysis work now with 1.5/fb recorded. A huge effort would be required again but now the holiday season is upon us and it would not be worth it for the relatively small amount of additional data. There is a slightly better chance that a reanalysis will be start in one months time when the next technical stop provides a natural break with at least another 1/fb added to today’s total collision database. 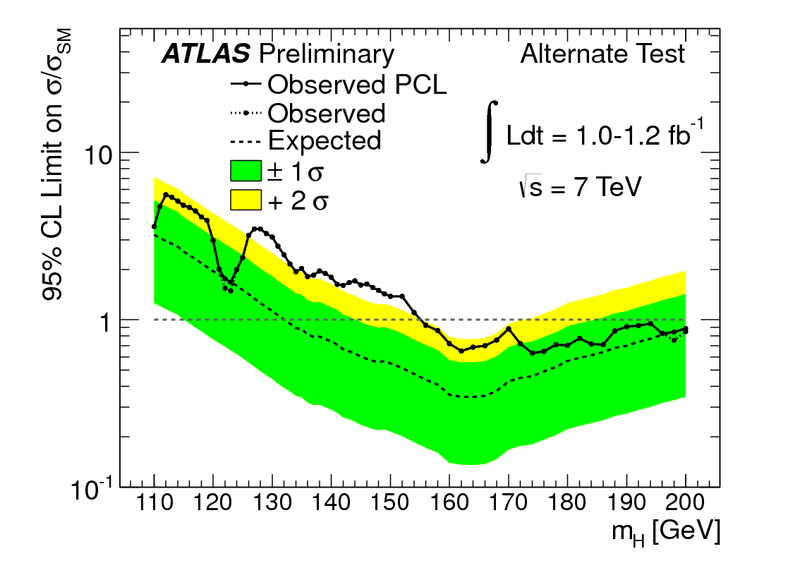 We may even have to wait until the end of this year’s physics run when 5/fb will be recorded in each of ATLAS and CMS. What if the standard model Higgs is ruled out? Can a SUSY Higgs multiplet survive? Will they be forced to search for a non-standard higher mass Higgs, or will a Higgsless symmetry breaking mechanism be required? All I know for certain is that a lot more Higgs buzz is still to come by the end of this year. You are currently browsing the viXra log blog archives for July, 2011.